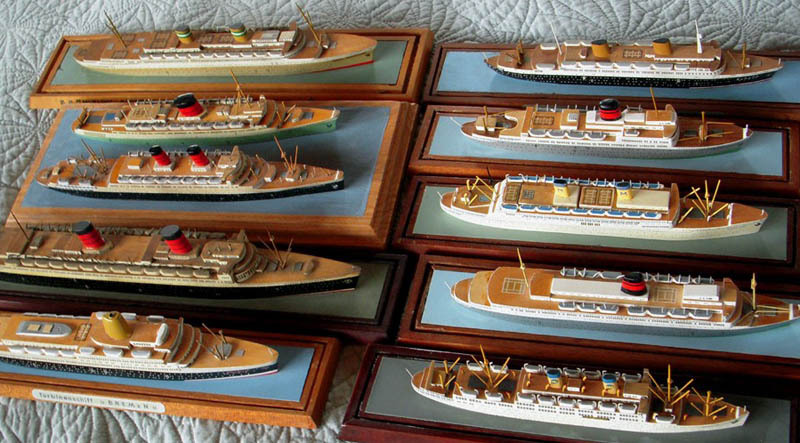 Little is known about this German workshop which produced these very attractive wooden ship models. Range of modeled ships suggests that Richard Wagner workshop was functioning from late 1940s to 1960s. Recalculated scales for most models are in 1:900-1:1200 spectrum, but models in smaller and larger scales are known. Wagner models show wonderful vivid colors beautifully contrasting with naturally finished wooden decks. Earlier models from 1940s had hand written names. Later, names were decaled, as well as all windows, portholes, anchors and some other details. Simplicity of architecture and details places these miniatures in the group of ID style models, next to Van Ryper (USA) and Bassett Lowke (Great Britain). © 2011 Scherbak Ship Models . All Rights Reserved.